We purchased a beautiful Flyscooters LaVie in January of 2009. It had been brought back to the dealer by the original buyer because it was too slow for her. We haven't figured out why she wanted to go faster on this scooter. It had less than 1000 miles on the odometer. Not even broken in. It is "fire-engine" red. It came with a rear trunk mounted. I was told that most LaVies do not. It had already had an oil change, so that was not necessary from the start. This scooter is plastic over metal tubing. I think that plastic holds paint better than metal, but I'm not sure about chrome. The exhaust system gathers rust easily. A little stove black paint touches this up nicely, though. Some of the chrome has shown mottling, and even some of the paint. I attribute this to the fact that it has sat outside since we bought it. The seat is fairly comfortable, but I do not like the hinge attachment. It seems very flimsy. The carburetor is easily accessed once you take out the "pet warmer" bucket under the seat, and remove the seat. The body panels look very difficult to remove and replace, I don't want to get involved. The headlight quit working, so I changed the bulb to a different type, and it promptly burnt out. I was fed up with this, so I had our dealer replace it the second time. The light from the headlamp is not the greatest, so I run the high beam at night. The front and rear disk brakes stop this bike really well. I've already had one really scary panic stop, the scooter stayed upright, even though it went into a skid. 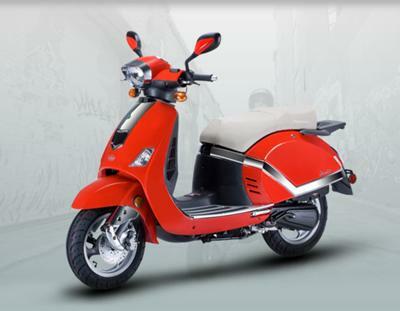 The scooter makes one feel confident that the rider can keep up with urban traffic, and stop when needed. It gets great gas mileage, about 70-72 mpg. The carburetor had to be rebuilt at about 4000 miles, because, I'm told by our mechanic, that ethanol eats Chinese rubber quickly. It has burnt up two starter solenoids, the second time leaving me stranded over the weekend, till the mechanic shop opened. The engine has an oil leak, which can only be fixed by splitting the engine cases. Darn! It did develop a gas leak, in one of the lines, which I was able to repair myself. The "pet warmer", or under-seat storage is roomy, and holds my Froggs Toggs rain gear as well as some other things. The rear trunk will hold two bags of groceries and my purse. The 12" wheels give the scooter a little more secure feeling than do a scooter with 10" wheels. However, I am a healthy 5'7" and cannot flatfoot this scooter. The foot-board is pretty wide. It will ride two up, and not too bad for short distances, as the seat is roomy. I wish this scooter would ride a little better, one feels every bump in the road. I think that maybe this is just a fact of life with small Chinese scooters. Metal and rubber foot-board covers can be bought for about $25, and they spruce up the scooter nicely, as there is a lot of black plastic in the rider area. Soft handle grips were added to make my hands feel better. The scooter is easy to get up on the center stand, if you know what you're doing. That's where you need it to check the engine oil. I can kick start this scooter, usually on the second or third kick. I would recommend this scooter to anyone who needs a pretty scooter for urban riding. I've been told several times "Nice Vespa". What a compliment! Similar scooters under other badges are: Lance Milan, Q-Link Sienna. I wish how readily you suggest a benefit to anyone who questions. You necessity distinguish total of the studyfaq scam online. Holding this warmhearted of assets of know-how requirement be very spectacular. I want to be you sometime. I do think that you can transfer concentration upon essay hell service. I think you'll find people who find themselves certainly not specific pertaining to. People that love to accomplish his or her operate nevertheless get a person please take a subsequent search also need to find route about how along with best places to attempt this specific. I really like that model of Flyscooter Lavie due to top class speed, fuel average and elegant colors as well. Check out http://www.boomerangreview.com/a-writer-com-review/ and then make any important decision after reading unique comments. I put 4300 miles on my Zuma in 2 years and it needed nothing but an oil change. The laundry list of repairs does not impress me. I don't understand why it can't keep up past 30 mph been a 150cc. I suppose it should, up to 60 MPH. My Buddy can keep up, up to 50, probably 55 mph. Unless I am reading the odometer wrong. Is that a typo? Thanks for an extensive review. That's a good assessment of the type. I'm glad to see you've gone so many miles with a reasonable amount of repairs. Having over 4,000 miles on both of your China scoots shows that they don't crumble and die in 18 months and stop inside of 5,000 miles.